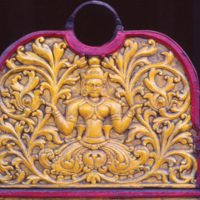 Description: This representation of the Narilata on the lintel of the wooden doorway of the Vakirigala temple in the Kegalle district, Sri Lanka, is extremely important for its symbolic meaning. Taking the place of the Laksmi motif, the Narilata seems to symbolize prosperity and good fortune. The carving seems to belong to the Kandyan period (1529-1815 A.D.). Description: Painted at the two ends of a palanquin or ‘dolava’ used in the annual procession at the Gadaladeniya Vihare in the Kandy district, Sri Lanka, are narilata motifs. This representation is probably a work of the Kandyan period, although the temple itself dates to the 14th century A.D. 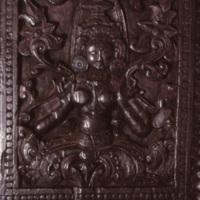 Description: Expressed in the medium of wood is this 17th century A.D. wood carving of a Narilata which occurs as a decorative panel on a pillar at the Ambakke devale, Sri Lanka. Description: This example of a Narilata motif belongs to the 14th century A.D. 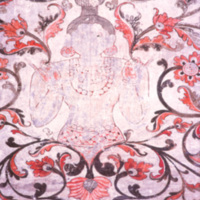 It is one of two such motifs painted on the overhead arch at the centre of the main shrine of the Lankatilaka temple near Gampola, Sri Lanka. 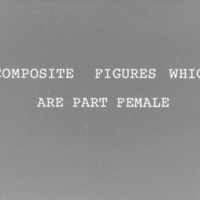 Description: Composite figures which are part female: Frequently met with in Sri Lankan sculpture and painting are figures which are only part female. The most popular among them are Narilata and Kinnari forms. 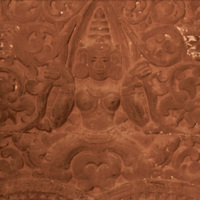 They are female above and waist dowards the narilata are shown with foliage design and the Kinnaris take the form of birds. 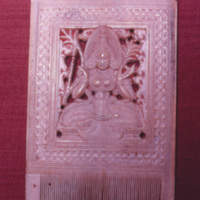 Description: On the subject of love, is this ivory comb from the Colombo National Museum. 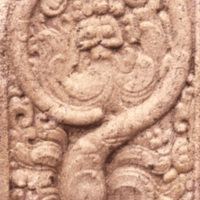 The carving seems to be of a female cupid, rather unusual in art, with a sugar-cane bow. Description: Among the auspicious items carved on this ivory comb, exhibited in the Colombo National Museum, is an amorous couple. Two other stages of motherhood are carved on separate panels. According to some, this is an illustration of the Krishna legend. 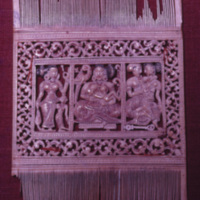 An ivory comb being a bride-groom’s gift to a bride, mithuna couples and mothers of children were no doubt considered both relevant and auspicious. The comb may be assigned to the 18th century A.D. 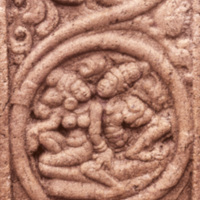 Description: This couple forming part of the ‘Tree of life’ or Kalpavruksa carved on one of the stone pillars at the Atadage in Polonnaruva bears a close resemblance to the ‘Isurumuniya Lovers’. 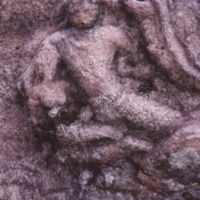 It probably belong to the period, 11th to the 12th centuries A.D.
An amorous couple coming out of the jaws of makara. Description: Mithuna couples are also seen on one of the makara reliefs at the Vijayarama temple in Anuradhapura. As in most other examples, the female emerges out of the makara jaws before the male in whose lap she sits.